I plan my trading for the week ahead each weekend. 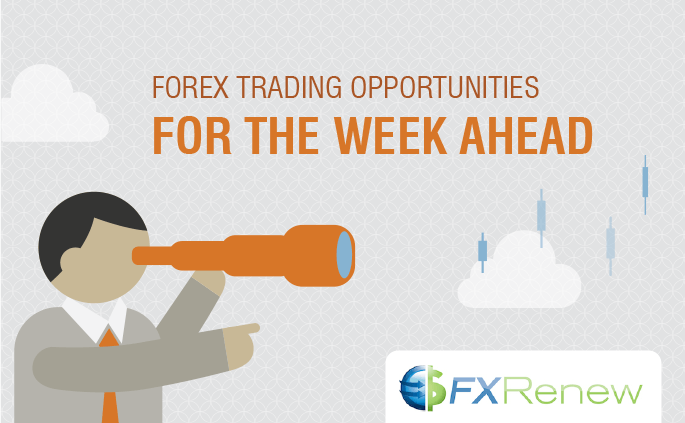 Here are the Forex trading opportunities I will be stalking this week. Wait GBP/USD. – MT is sideways volatile. We have seen something of a weekly double bottom (it’s a bit rough, but significant enough to count). The rise was further fueled by optimism by the BOE, which has overridden fears relating to a possible Brexit for now. I anticipate further upside in the pair but prefer to play GBP vs. CHF rather than USD. Wait USD/JPY. – MT is sideways normal. I would love to be getting short USDJPY here. We are in a clear downtrend with a sideways consolidation, Abenomics, ZIRP is failing (deflation strengthens currencies) and US sentiment is weak. But BOJ are intervening/ signaling to the market they are ready to intervene (using a practice called “checking prices”), so it is hard to get a low risk entry with the price jumping 100 pips each time we get near 1.10/11. So best to wait on the sidelines for a confirmed break. Buy AUD/USD. Trend – MT is bull normal. Aussie data continues to be positive (despite previously weak employment numbers and terrible trade data out of China), the RBA remains on hold, and there is a bounce in metal prices, so investors who are looking for a place to park their funds and gain some yield are happy to jump into the AUD. As mentioned previous, I also think AUD and NZD are prime candidates for capital flowing out of China. Longer-term this capital outflow will end up bearish for AUD, and global trade is contracting so I am not switching to long-term bullish AUD, but for now the correct approach is to buy. Wait EUR/USD. – MT is sideways volatile. We are almost turning bullish on the back of a more dovish than expected Fed. I think it is ok to be long here, but possibly best to wait for a clearer picture. Wait NZD/USD. – MT is sideways normal. Been a bit of a wild ride on the kiwi with the RBNZ unexpectedly cutting rates, and then the Fed chiming in. We remain in the sideways range but Fridays selling may well have been profit taking so I am not sure the range will hold. .6900 is a major level and we traded close to it on Friday so think we need to watch patiently for now. Hard to get too excited about being long with a dovish CB. Sell USD/CHF. Breakout – MT is bear normal. Continue short but with a deal of caution as we are sitting at support. SNB reiterated there dovish stance this week and with negative rates and stocks up ( though admittedly the Swiss stock market is one of the weakest) it is hard to get excited about being short, unless you think this USD weakness is going to continue. Wait EUR/CHF. Trend – MT is sideways normal. Chopping around mid range for now, look to buy if we get back toward 1.08. Sell USD/CAD. Trend – MT is bear normal. The rapid sell-off in USDCAD continued last week. Oil extended it’s move higher and the next level of support is still a couple of hundred pips away at 1.28. Keep going short with a close eye on the oil market. If Oil resumes its downtrend (or we get anther catalyst) I expect CAD to rapidly move higher, as it is now well oversold. Wait EUR/GBP. – MT is sideways normal. I see reversal potential here on EURGBP. Draghi dovish (despite his speech blunder) and BOE coming in with a more positive tone combined with some topping formations (including Thursdays bearish outside day) and GBPUSD upside suggests that we may see a turn in the pair. Contrarians could look to build a position within this range for a move lower. Buy AUD/JPY. Trend – MT is bull normal. Keep buying but we may be turning a sideways here. Wait NZD/JPY. – MT is sideways normal. Sitting mid range so wait. Wait GBP/JPY. – MT is sideways normal. A breakout over 165.00 might be worth a small position. Wait EUR/JPY. – MT is sideways normal. Wait for now. Wait CAD/JPY. – MT is sideways normal. Wait for now. Wait CHF/JPY. – MT is sideways normal. Wait for now. Wait GBP/NZD. – MT is sideways normal. Wait for now. Wait EUR/NZD. – MT is sideways normal. Wait for now. Buy AUD/NZD. – MT is bull normal. Buy but possibly on a dip as we have a bearish weekly hammer in place. Wait EUR/AUD. – MT is sideways normal. Wait for now, though I do favor selling. Wait GBP/AUD. – MT is sideways normal. A weekly bullish pin candle off support signals caution to bears and a possible contrarian buy. Wait AUD/CAD. – MT is sideways volatile. Wait. Wait GBP/CAD. – MT is sideways normal. Wait. Wait EUR/CAD. – MT is sideways volatile. Wait. Sell NZD/CAD. Trend – MT is bear normal. Keep going short. Wait GBP/CHF. – MT is sideways normal. Like GBPAUD, a bullish engulfing off support a couple of weeks ago makes this a tempting contrarian buy. Wait NZD/CHF. – MT is sideways normal. Wait. Wait AUD/CHF. – MT is Sideways normal. Careful of double top forming. Trend: Market is trending in the direction I have listed and I expect it to continue. Reversal: I am looking for a reversal against the current trend. Breakout: The currency pair is breaking out of a range. The post Forex Trading Opportunities for the Week Ahead 21 March 2016 appeared first on www.forextell.com.